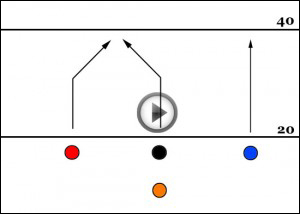 This play is designed to overload the deep coverage. Red is running an 8 route (post) and Blue is running a 9 (streak). The center should delay his route after snapping the ball. The goal is that two people will cover Red and the center (Black) will sneak through underneath. Tip: From the description, you might think that Blue is just a decoy. What makes this play work well is that Blue has free reign to adjust this route based on the defense. A couple alternatives would be a post (8), post-corner (87), or an out-n-go (39).